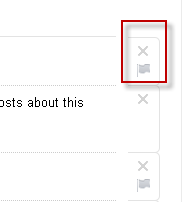 Google+: How do I delete user comments on my stream? When sharing posts with other users on Google+, there may be negative or abusive comments on them that you wish to remove. Here is how to do it. 2. Find the stream that you want to remove comments on, click the small arrow at the top and choose Report or remove comments. 3. Find the comment, click the X button to remove it from the post or click the flag button to report abuse for it. 4. Click the Delete button to confirm your action. 5. You can not undo when you delete a comments. However, you can undo the reporting abuse process by clicking the Undo button.